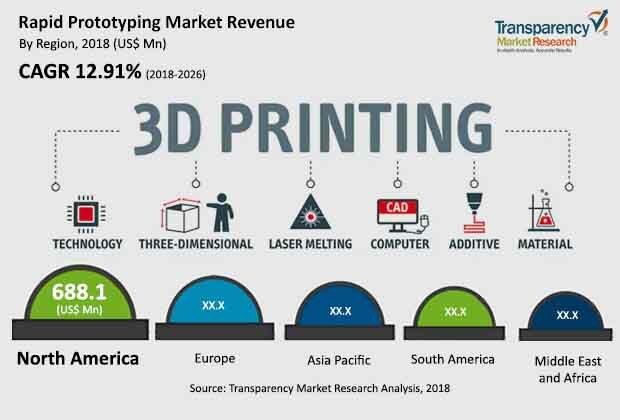 The global rapid prototyping market was valued at US$ 1,928.2 Mn in 2016 and is projected to register compound annual growth rate (CAGR) of over 12.91% from 2018 to 2026, according to a new report published by Transparency Market Research (TMR) titled “Rapid Prototyping Market – Global Industry Analysis, Size, Share, Growth, Trends, and Forecast, 2018–2026.” The report suggests that rising use of rapid prototyping across automotive, consumer goods & electronics, and healthcare industries worldwide along with the rising trend of 3D printing technology around the globe is likely to spur the demand for rapid prototyping in the coming years (2018 to 2026). As key players introduce new rapid prototyping in developed markets such as North America, Europe, and Asia Pacific, these regions are likely to account for dominating share of the global rapid prototyping market. Growing demand for rapid prototyping from the growing consumer goods & electronics industry in emerging markets such as China, Japan, and India is likely to boost growth of the Asia Pacific rapid prototyping market at a growth rate of around 15% from 2018 to 2026. Rapid prototyping has gained significant attention and has become one of the most sought after technological advancements. Rapid prototyping helps in the manufacturing of a product effectively by reducing the time between the design and final production. Initial cost of a 3D printer used for rapid prototyping is very high and this initial cost is one of the prominent factors holding back the growth of 3D printing and rapid prototyping. For instance, high quality 3D printers can cost upward of up to US$ 2 million. Furthermore, one of the issues with rapid prototyping is that 3D printers tend to be small and as a result the size of the developed product is also small. However, there are huge 3D printers available in the market, but the cost of such printers is very high for smaller sized companies. With respect to cost, bigger industries such as automotive and aerospace have no problems in using the bigger 3D printers. However, many companies still have to use traditional methods of manufacturing until the cost of bigger machines goes down. Many players in the rapid prototyping space are trying to develop and offer cost effective 3D printers to excel in the continuously increasing competition and to promote rapid prototyping. Rapid prototyping is the creation of models at a higher speed, which are examined functionally and/or visually during the process of product development. Although the terms 3D printing and rapid prototyping are used interchangeably, 3D printing is the method and rapid prototyping is the end result. Furthermore, rapid prototyping is used in physical and non-physical product development. For instance, in software development, as an alternative to the traditional “waterfall” method, it uses “rapid application development” (RAD) rapid prototyping. Many industry verticals including automotive, aerospace, and healthcare are using rapid prototyping for product development, as it gives engineers and designers the benefit of design modification during the development stage until it is considered for production. Additionally, it is also a great way to test various finishes and materials on the product at a much faster rate before launch to market. In terms of value, North America was the leading contributor to the global rapid prototyping market in 2017. The contribution is primarily due to the booming rapid prototyping marketplace along with the presence of well-established players across the region, especially driven by the U.S. and Canada. The U.S. is home to many well-established players from the rapid prototyping domain including3D Systems, Inc., Stratasys Ltd., and Carpenter Technology Corporation. Furthermore, North America is witnessing higher adoption of rapid prototyping due to continuously rising automotive and healthcare industry. Many companies are trying to innovate novel products pertaining to rapid prototyping to compete with the other well-established players across the region and globe. For instance, in April 2018, Stratasys Ltd. announced advancement in its products namely J750 and J735 3D printers, to reduce the time-to-market and development cycles. Furthermore, it will help customers and designers to build rapid prototypes with streamlined design-to-prototype workflows for faster time-to-market. Stratasys Ltd., 3D Systems, Inc., GE Additive, and Sandvik AB among others are some of the major players operating in the rapid prototyping market profiled in this study. Various players are building partnerships to meet the continuously rising consumer demand with respect to rapid prototyping. In May 2017, Sandvik AB announced that it is partnering with Desktop Metal, a company that designs and markets metal 3D printing systems to supply the gas atomized metal powders designed for rapid prototyping for its 3D printing systems. Furthermore, this partnership will help both the companies in supporting the consumer demand for new additive manufacturing or rapid prototyping technology.